« Utah is taking the wrong approach. Mr. Obama, some of us are confused by your weekly address. We need a government that lives within its means without sacrificing job-creating investments in education, innovation, and infrastructure. (Emphasis mine) Mr. Obama, that statement does not mean what you think it means. The deficit has tripled since you came in to office. Not to mention the month of February 2011 has the largest deficit in history. 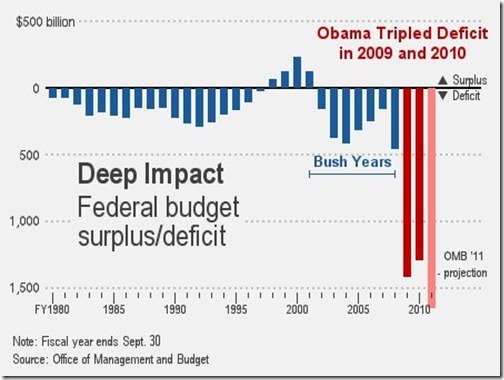 It was so big in fact, that it was bigger than the entire deficit from 2007. The government cannot create jobs, all it can do is take money and redistribute it to others under the guise of creating jobs. Why did the deficit need to triple? It is not the government’s job to innovate and it is not the government’s job to provide education either. The interest from the debt is going to reach a point where it is unmanageable. In order to live within your means sometimes means cutting things that you think are necessities but are actually luxuries. Many have been learning this fact first hand while Obama and family has been out playing golf and globe trotting. If you want to be within the means of our country, you need a surplus big enough to destroy sizeable amounts of the debt. Will it hurt, yes, but a small amount of pain now is preferable to the total economic collapse that awaits if things don’t change. H/T Alan who posted the Gateway Pundit article on GBC. Because, you know, those are worth going into debt for. Everyone has their own priorities. The current economy has made many reevaluate the differences between actual needs and wants. The government is spending money it doesn’t have on things it doesn’t actually need. You’re exactly right, especially if you’ve ever lived someplace where you see people living in subsidized housing. It’s quite amazing when you see people with all those necessities that I always thought were luxuries. Big screen TVs, satellite service, and a fridge full of beer. While the working public is tightening their belts, Washington has decided to hemorrhage money instead. Why should they cut back though, they have their dad’s credit card right?